I love cookies so was really happy with this month's picks. I used to make marshmallows pretty regularly as a kid for school fetes etc so I opted to make the Milan Cookies first. Unfortunately I then ran out of time to make the Mallows this month. Let me just say, the recipe makes a lot of cookies. A LOT. I would suggest you make a half batch unless you are feeding an army or you will end up throwing out some mixture like I did. While cookies don't seem particularly 'daring' these did test my piping skills - I ended up with lots of irregular blobby shapes but by the end was doing pretty well. The ganache was absolutely delicious but then I love fruit and chocolate together. The only change I made was to add just 2 ts each of the vanilla and lemon essences instead of 2 tablespoons (?!?!?). The only thing I didn't like was just how cakey these cookies came after they cooled down. I was hoping for something with a bit of crunch. That said they were still yummy and got the thumbs up from my taste testers! Its not cheap to get those cookies in my country! now i can make it myself ! thank u! 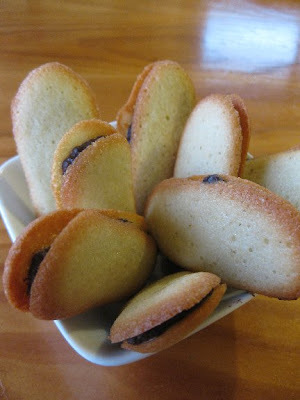 Hey, your cookies actually look like Milanos. Mine weren't even close. Weird, mine were definitely crispy. But I'm glad I made 1/6th of the recipe - I'd have waaay too many cookies with the full recipe!